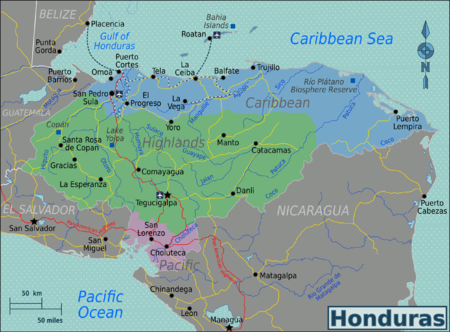 For future reference the Wikitravel:CIA World Factbook 2002 import can be found at Talk:Honduras/CIA World Factbook 2002 import. I would put all of the eastern province (Gracias a Dios) in the Caribbean region. The thing about the interior is that there isn't much of anything in what would be the eastern interior region—I think Juticalpa and Catacamas are pretty much the only towns with more than 30,000 residents? But I'm not necessarily objecting to the split, just laying out the rationale. This page was last edited on 26 April 2010, at 02:49.